Appearance Donkey Kong Country 3: Dixie Kong's Double Trouble! 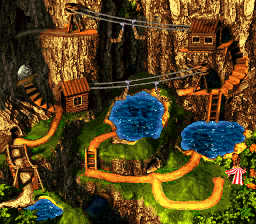 Razor Ridge is the sixth world of Donkey Kong Country 3: Dixie Kong's Double Trouble!. Razor Ridge is located near a large fissure and filled with whirling machinery. Due to the fissure, the only way to travel between areas is through the use of a chairlift. Razor Ridge has many caves and vast areas of cliffs. At the base of the cliffs are cesspools with pitch-black water, created from floodwater runoff. The Brothers Bear twins Benny and Björn reside in Razor Ridge. Benny runs the chairlift near the beginning of the area whereas his brother Björn runs a chairlift on the other side of the ridge. The boss of Razor Ridge, Barbos (changed to Kroctopus in the Game Boy Advance remake of Donkey Kong Country 3) is located almost directly in the middle of the region in a large, scowling body of water. Razor Ridge's Banana Bird Cave is located across from Björn's chairlifts. The Kongs must repair Björn's broken chairlifts with a No. 6 Wrench in order to reach the cave. This page was last edited on January 18, 2019, at 01:02.